Remind 101 is a website and mobile app with one singular purpose - sending text or email alerts to your subscribers' cellphones or inboxes. Its used mainly in an educational setting, but there's no reason any organization with a need for quickly distributing information to its members could not utilize Remind 101. 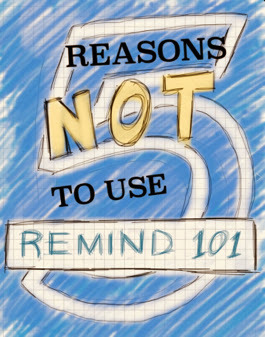 We're hosting a Remind 101 session in our building this Friday during our half-day PD, so I wanted to get ahead of those that may be curious and give you some reasons NOT to use Remind 101. 1. You don't have a smartphone. Or a tablet. Or a computer. Oh, you do have at least one of those? Nevermind. There are many ways to access and send Remind 101 messages! I don't have a smartphone, but I use the website and the app on my iPad equally. 2. You don't know how to write an email. Sending a Remind 101 alert is as easy as sending a short email message. In some respects, its easier, because you do not have to address it to individual recipients. You just click on the class, type the message, and it goes to every student that has subscribed to that class. Even BETTER than email, you can schedule the message and control when it gets sent. I usually type my messages during class, but set it up to send during passing time or after school. 3. You don't want students to have your cellphone number. (or you don't want to be responsible for knowing your students' numbers). NOT A PROBLEM! Students sign themselves up using the class code you provide and Remind 101 takes care of all the phone numbers. The only thing you see are your students' names and YOU never even have to enter your number. 4. You want your students to be responsible for ALWAYS writing down the homework off of your chalk/white/SMARTboard. Sending reminders and alerts to their cellphones will train them to be lazy. Just make sure you'll hold yourself to that same standard when it comes to your own text and email alerts. I get the responsibility angle, but does that mean we SHOULDN'T use a technology at our disposal? Honestly, if I could get a text alert every Tuesday night at about 10 o'clock to make sure I put the trash at the curb, it would change my life. 5. Homework is really just a tool to punish kids who refuse to do it. Sending a reminder to a kid's phone would increase the chance they might study on any given night, and you won't be able to triumphantly enter a zero into the gradebook the next day. Our students look at their cellphones ALL DAY LONG. We compete all day long for attention with Instagram, Twitter, and text messages from family and friends. Remind 101 is an easy to use tool that puts your class information right in front of their faces.